Please be forewarned: I'm going to stomp around one of my favourite irritation paddocks. Do you like to plan your gaming schedule ahead? I know a lot of people who do, and I admire them; it's a grand thing to do in a far too busy world. 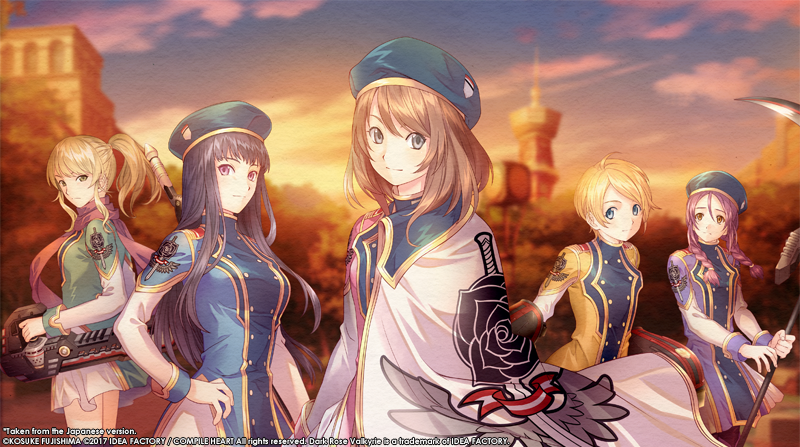 Where do we slot in Dark Rose Valkyrie, you ask? It's still the same slot as it was 5 months ago, when I reported on this very promising-looking PS4 game by CompileHeart. Idea Factory International is a much-loved publisher here at DDNet, so I'm genuinely upset that they appear to have dropped the ball with a game that we are looking forward to - and would like to fit into our busy schedules! Oh, we do get updates — the usual drip-feeding of a slice of new character detail here, a dollop of new weapon system there — but somehow the clocks have stopped at IFI and they haven't noticed that spring is, officially and meteorologically, here. We were promised this game 5 months ago, for “spring 2017.” Hello, early spring calling! Which part of spring is it to be? If it’s going to be “late spring,” that would be helpful to know. I get the feeling that Dark Rose Valkyrie is being treated rather like an unloved stepchild. Yoko Taro is the gift that keeps on giving. We’ve just been blessed with NieR: Automata, and his next hit is already on the horizon (for Japan, at least). SINoALICE is a mobile RPG about a dystopian world where heavily-armed fairy-tale characters are caught up in an endless conflict. Square Enix has released a new trailer introducing the various systems at play. SINoALICE has a real-time, party-based battle system focused on betrayal, with friends becoming enemies and vice versa as the story progresses. It’s also got all the usual mobile RPG goodies like a gacha system, a multitude of weapons that can be collected and upgraded, and a job system. Of course, this is a Yoko Taro game, so story is going to be a big deal — and it’s built into every other facet of the game. SINoALICE follows a number of characters with stories that intertwine in a fashion similar to Odin Sphere. Weapons and jobs each have their own stories that unfold as you level them up, and it even seems like the gacha system has some sort of narrative context. Kamiko, revealed in the latest issue of Japanese gaming publication Famitsu last week, is an upcoming title for the Nintendo Switch from Fairune developer Skipmore. Fairune was given a two-star review from Matt S. due to its puzzle mechanic being quite simple. Having personally played the title as well, I did find the creativity behind the combat system to be a breath of fresh air despite the simplicity. That means Kamiko should not be off your radar just yet. Since the initial reveal, the above teaser has dropped. The games developers are partnered with the publisher Circle. While no official announcement for a Western release has occurred, Circle has published their previous titles outside of Asia. Kamiko will be available via the Nintendo eShop in Japan, launching later this month. The title will retail for 500 yen. I'll freely admit to being an abject Sword Art Online fan. It remains the only anime that I have watched through two seasons together with my husband, start to finish — that says a lot for the pulling power of the SAO world and characters. I'll grab any opportunity to add another SAO game, figurine, or board game to my shrine. Wait — did I say board game? Yes, indeed! It's on Kickstarter and has of course already smashed its modest pledge goal five times over. There are only hours left to go to sign up for this convenient way — with very favourable shipping costs worldwide — of adding another item to your collection. Once backer fulfillment is complete, it will be available only via JapanimeGames.com and at Japanime Games convention booths around the world. The story of Sword of Fellows is based on the first SAO arc, “The Aincrad Arc,” which you may be familiar with from the first season of the television series. Stuck in a VR MMORPG, the SAO characters need to fight their way, cooperatively, up the levels of Aincrad to beat the game and thus be freed from their entrapment. Playing time is given as about 30 minutes, the game works for 1-4 players, and the suggested age is 10+; it’s nice to see that it's a family-friendly game! 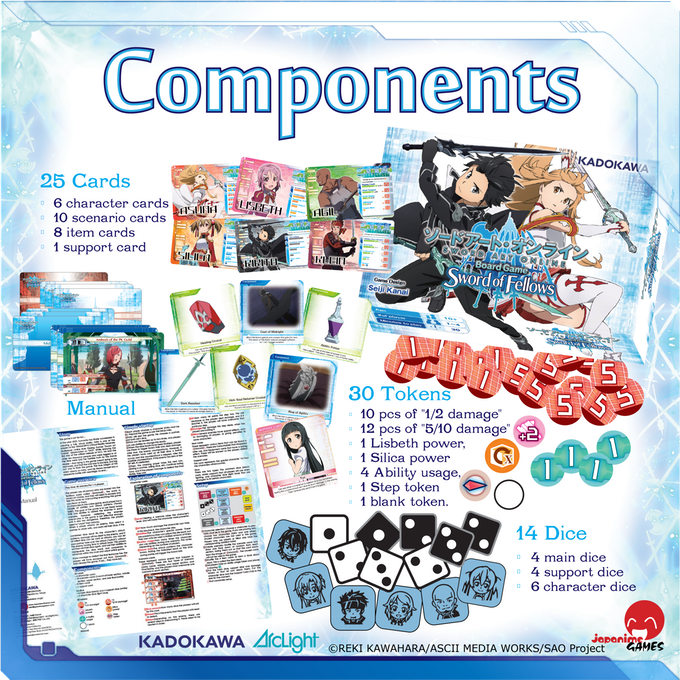 If you look at the game components in the image, you'll quickly realise that they are pretty standard items for a dice-based game: the various tokens and dice designed to do the heavy lifting in the gameplay. If you want to watch a trade show preview, there is a video on the Kickstarter page with BoardGameGeek, who looks vaguely unimpressed. 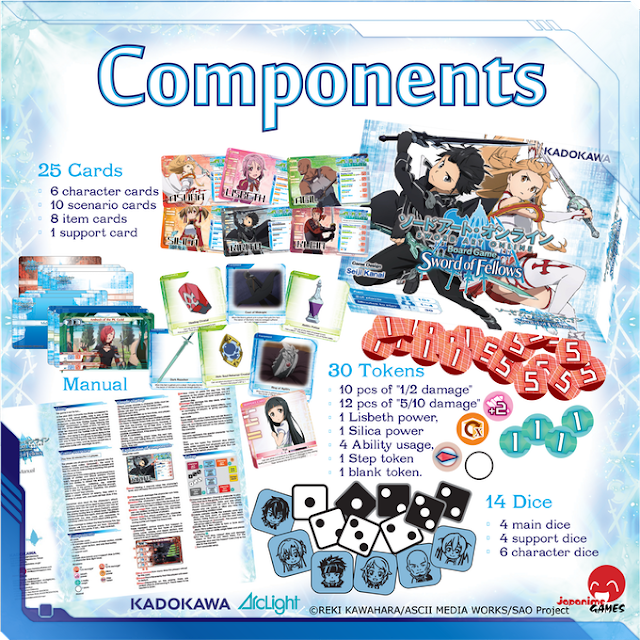 This product is squarely aimed at fans who hanker after immersing themselves in the SAO world at the drop of a die. It looks like a straightforward game, to be enjoyed for a quick round. Nothing wrong with that ... says the unreconstructed SAO fan. Enhancing this immersion factor is the design of the game, which is in the hands of Seiji Kanai, known for his work on the popular board games Love Letter and R-Rivals. The game is developed by Arclight and published by Kadokawa, so the production side is definitely in competent hands. In keeping with the barebones nature of the game, the Kickstarter tiers are mercifully kept straightforward with a Standard edition and a Deluxe edition. Japanime Games is clearly testing the waters with this anime adaptation board game, as they have indicated — via their Kickstarter Updates page — that they are looking at other anime series to adapt for future games. So far, the Kickstarter response seems to have borne out their punt on an anime with deep fan support.